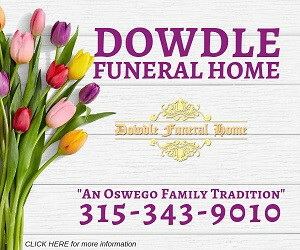 Paul L. Carson Sr., 75, of Oswego passed away unexpectedly Sunday, February 3rd, 2019 at the Oswego Hospital. Born in Oswego, he was the son of the late Francis and Catherine (Donahue) Carson. Paul and his brother ran their family’s business, Carson’s News for many years. Paul then worked for the Diocese of Syracuse at St. Paul’s Academy (Trinity Catholic) as a jack of all trades. He retired after 35 years of service and will be forever known to school and community members as their beloved “Mr. Carson”. After retirement, Paul continued to spend time helping the school, specifically plowing snow during the harsh Oswego winters. He loved spending time with his family, grandkids, and great grandson. Paul especially loved caring for his dog Bella, as well her sister Emma to whom he provided a loving “doggy daycare ”. He also loved spending his time tending to his house and yard, keeping an eye on the neighborhood, and decorating his house for holidays, specifically during the Christmas season. He was inducted into the Oswego Softball Hall of Fame as a sponsor, and also assisted the Oswego Fire Department as a videographer. He is survived by his loving wife of 52 years, Bobbie Jean (Borden) Carson; children, Paul II Carson, Christine (Mick) Bradshaw, and Chad (Debbie) Carson of Oswego; grandchildren, Carley, Miranda Carson of Oswego. Gregory, Trevor, Jenna Bradshaw of Oswego. Eric, Brady, Chloe Carson of Oswego. Great grandchild Colin Carson of Oswego. He is also survived by many nieces and nephews. In addition to his parents, he was predeceased by siblings Sally Maher, Mary Jane Metcalf, and Francis H. Carson. Calling hours will be Saturday, 11-2 PM at the Nelson Funeral Home, 11 West Albany Street. In Lieu of flowers, to remember Paul in a special way, please send donations in his name to Trinity Catholic School 115 East 5th Street Oswego NY 13126.